Tenri Cultural Institute, 43A West 13th Street New York City is pleased to present Vanitas: Jong Myung Hwang, a solo exhibition that will run from May 16-30, 2017 with an Opening Reception onThursday, May 18th from 6-8pm. The exhibition title Vanitas, refers to a category of artworks associated with still life painting of 16th and 17th centuries in Flanders and the Netherlands.Vanitas in Latin as a noun means "emptiness," and Vanitas painting refers to material life associated withall physicalaspects and pursuitsusually and containing rotting fruit or skullsas subject matter. Jong Myung Hwang expresses the meaninglessness and emptiness of modern society's vanity in which people clothe their inner loneliness, and fear of death with external splendor. 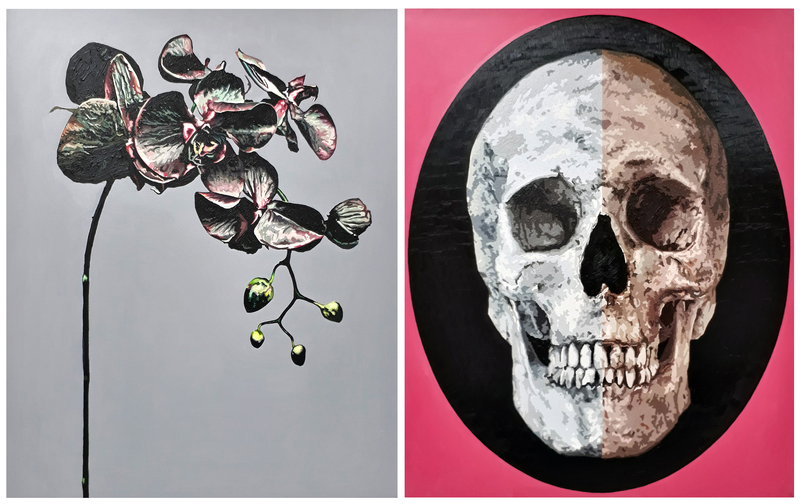 Hwang primarily uses the concept of death as skull contrasting it with living things such as plants or flowersor with other live illusionistically portrayed objects. Hwang also depictspessimistic portraits of contemporary humans inbrilliant color, reminding us of the man-made electric lightssurrounding us. His use of contrasting dark and vivid colors is vigorous enough to make the viewer feel animated which is contrary to the theme of death. His works questionthe idea of death, the meaninglessness of earthly possessions and pursuits, as well as modern life. Jong Myung Hwang was born in Seoul, Korea. He received both his BFA and MFA degrees from the Ecole National Superieur de Beaux-Art de Dijon in France. In the past twenty years He has been exhibiting his works, in South Korea, France and the United States. FOR MORE INFORMATION: Please call or email to Tenri Cultural Institute, at 212.645.2800 or tci@tenri.org or the curators Thalia Vrachopoulos at tvrachopoulos@gmail.com 212-691-7978 or SuechungKoh at pariskoh@gmail.com 201-724-7077.